Run out of file storage but don't need to upgrade to more projects? Just add on some extra file storage to your account. You can add 15, 20, or 30 GB of extra storage to an account. Only the account owner and billing liaisons can change your plan. Go to the Upgrades page, at the top right of your Basecamp 2 account. 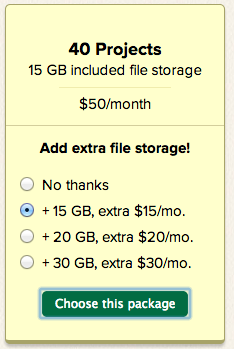 Choose the extra storage you'd like to add, then click "Choose this package." Basecamp will ask you to confirm your new package and the monthly charge. 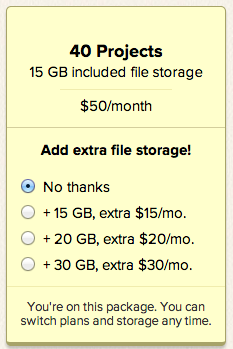 Your extra storage will be available immediately, but we'll only charge you on your billing date. Extra storage is tiered according to plan, meaning that the amount of extra storage you can add depends on your current plan. 10 Projects: 5, 10, or 15 GB. 40 Projects: 15, 20, or 30 GB. 100 Projects: 20, 40, or 60 GB. Unlimited Projects: 25, 50, or 100 GB. We're also happy to give you another amount if you write to us!